abstracts a proton from an [Al(H2O)6]3+ complex. I am the developer of the molecular dynamics (MD) module in the ORCA program package. 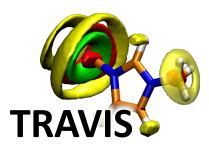 This module enables to run ab initio molecular dynamics (AIMD) simulations of small to medium-sized (non-periodic) systems, using all the different electron structure methods which ORCA includes (Hartree–Fock, Semiempirics, MP2, DFT with LDA, GGA, Meta-GGA, hybrid, and double-hybrid functionals, excited state dynamics, continuum solvation models, multi-reference calculations, etc.) There exists rarely any other ab initio molecular dynamics package which offers such a wide variety of methods, which underlines the synergistic effect of including an MD module into ORCA. Molecular dynamics simulations can employ Cartesian, distance, angle, and dihedral angle constraints, which are enforced by the RATTLE algorithm. The MD module features cells of several geometries (cube, orthorhombic, parallelepiped, sphere, ellipsoid), which can help to keep the system inside of a well-defined volume. The cells have repulsive harmonic walls. Trajectories can be written in XYZ and PDB file format. A restart file is written in each simulation step. With this file, simulations can be restarted to seamlessly continue (useful for batch runs or if the job crashed). Ability to individually define regions (i. e., subsets of atoms). Regions can be used to thermostat different parts of the system to different temperatures (e. g., cold solute in hot solvent), or to write subset trajectories of selected atoms. The energy drift of the simulation is now displayed in every step (in units of Kelvin per atom). Large energy drift can be caused by poor SCF convergence, or by a time step length chosen too large. The language of the input for the ORCA MD module is SANscript, which is a scripting language for scientific purposes that is currently under development. A full documentation of the language was not yet published. For a first glimpse, please see the SANscript page. If you have suggestions on useful features which could be implemented in future releases of the ORCA MD module, feel free to contact me via email. A library with many input files for ORCA AIMD runs will be established here at a later time. Please also have a look at the ORCA input library, where many input samples for ORCA can be found.